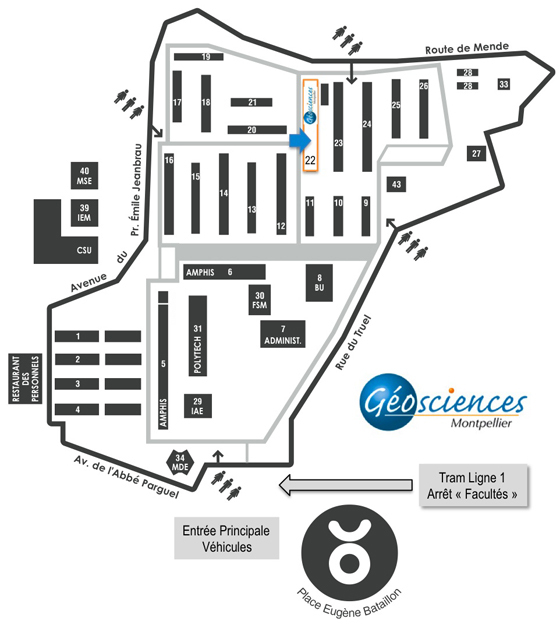 Géosciences Montpellier - Where to find us ? Géosciences Montpellier is located on the Triolet campus of the University of Montpellier, in the north of the town (district "Hopitaux-Facultés"). You can easily access it from the TGV train station through the tramway line 1 (blue trolleys) in the "Mosson" direction, stop "Universités des Sciences et des Lettres". Walk then a further 200 m until a red "monument" in the middle of a roundabout, near which the entrance of the Triolet campus is located. Tram tickets can be bought directly at the tram station from an automated machine. By car, follow the direction of the district "Hôpitaux-Facultés", then follow the signs "Université Montpellier 2 - Sciences et Techniques du Languedoc". Inside the campus, Geosciences Montpellier is located in the building 22.